As far as anybody can tell, the origin of American schoolchildren giving an apple to the teacher cannot be traced to one definitive moment or source. The tradition seems to have been born from practicality, then nurtured by happy coincidences working in concert sometime between 1880 and 1920, with an early-19th century prologue. To answer the question is to create the sort of messily insane, pieced-together timeline you see on police procedurals, its various dots connected with red string. It’s the kind of explanation that doesn’t make for the sort of satisfying trivia you can whip out for cocktail party small talk. But to investigate it is to delve deeply into our nation’s history and folklore. This story begins with John Chapman, a.k.a. Johnny Appleseed—probably not all that shocking, considering this story is about apples in the 19th century. While the non-native apple had been transplanted from England with the first settlers back in the early 1600s, it was the efforts of Chapman and fellow settlers to the Northwest Territory in the early 1800s that ushered in the ubiquity of the apple throughout the country. Back then, apples didn’t taste like the apples we have today. Early-American apple trees were usually grown from seeds, not grafted, which results in bitter or sour fruit not suitable for eating. As such, those apples were mainly used for making hard cider. Fortunately, old-timey folks loved cider and drank a ton of it—largely because cider, unlike water, wouldn’t give you dysentery. Anyone who’s ever played Oregon Trail (or worse yet, actually lived it from atop a covered wagon) knows what a bummer that is. Those early Americans were also really into growing, cataloging, and experimenting with fruit, and apples in particular. In the book Nomenclature Of The Apple: A Catalog Of The Known Varieties Referred To In American Publications From 1804 To 1904 by W.H. Ragan, the author cites more than 14,000 varieties of apples that were grown in the United States in that 100-year span. By comparison, approximately 100 varieties are commercially grown today. As to what happened to the other 13,900, we must look to the Second and Third Wave Temperance movements. The fact that most apples in the 19th century were used for cider naturally didn’t sit well with opponents of alcohol like Carrie Nation, famous for wielding an ax in saloons—and in apple orchards. Backlash from Temperance Leagues only solidified the apple’s connection to alcohol in the national consciousness, prompting growers to rebrand the fruit if they wanted to continue to turn a profit. As a result, by 1904, “An apple a day keeps the doctor away” had entered the popular lexicon. The apple was now publicized as a healthy food for eating, not just for drinking. Within this same timeframe, another progressive movement was gaining momentum: education reforms. Only about half of the nation’s 5- to 15-year-olds attended school in 1840s. By 1870, all states had public elementary schools, and by 1918, every state required children to complete an elementary education. Even before these reforms, there was a tradition, passed down from life on the frontier, of giving the teacher food in return for their services. And while by the late 1800s, teachers were typically no longer paid in food harvested by a clutch of pioneer families who couldn’t afford anything else, the custom symbolically persisted and spread, to the point where teachers and apples became synonymous. So why apples and not, say, a pear—or beef jerky? No one seems to know for sure. But the fact that autumn became the national standard as the start of the school year, with more students than ever reporting in the peak apple season of September—along with their being cheap, universally available, easily portable, nationally beloved, and newly decreed as healthy—grabbing an apple for the teacher seems like an obvious choice. 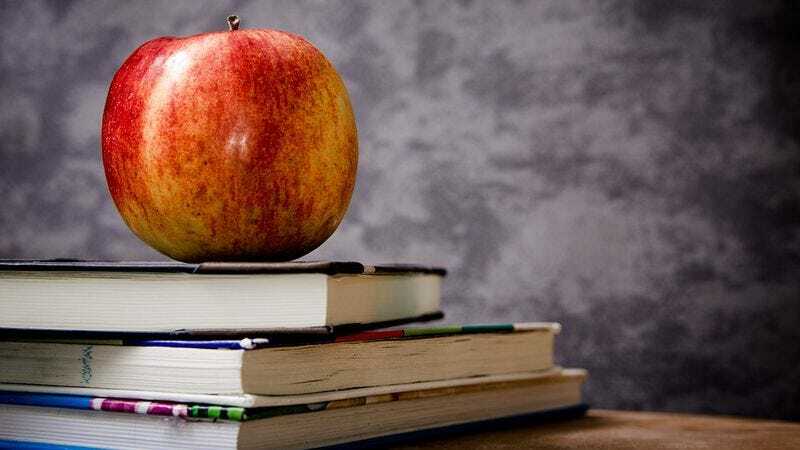 In short, we give apples to the teacher not on account of some long-forgotten legend or inveterate custom, but because of sheer practicality—fostered by a series of serendipitous events. As to why it’s persisted, centuries after frontier life, you can (as with so many things) blame pop culture. When Bing Crosby and Connee Boswell sang “An Apple For The Teacher” in 1939, and the next year’s Pinocchio saw Geppetto giving an apple to his little wooden son for his first day of school, the tradition became a trope. Decades later in 1983, the 1940s-set A Christmas Story saw schoolchildren giving apples to Miss Shields—and Ralphie lumbering in with a giant fruit basket. The audience responds not because they remember giving apples themselves, but because the association has become such a part of our cultural language. So while they may not get any actual apples anymore, our teachers will be receiving tchotchkes with apples on them for years to come.